TwitterFeed, in case you haven’t seen it before, is an interesting service that can automatically publish your RSS feed(s) into your Twitter account. This helps because the moment you write something new on your blog, a “tweet” is posted on your behalf informing all your Twitter followers about the new content. For instance, whenever I publish a new article here on Digital Inspiration, a tweet goes out to @labnol_BLOG courtesy the free and very reliable twitterfeed service. But now I am planning to make a switch from TwitterFeed to Google. Google today introduced a new Socialize feature inside FeedBurner that would allow blog publishers like you and me to quickly and automatically push updates on to Twitter without using a third service. All you have to do is log into your FeedBurner account and select the feed that you want to push to Twitter. Associate your Twitter account with this feed (it uses oAuth), add some prefix (like I use “on @labnol“) and activate the service. 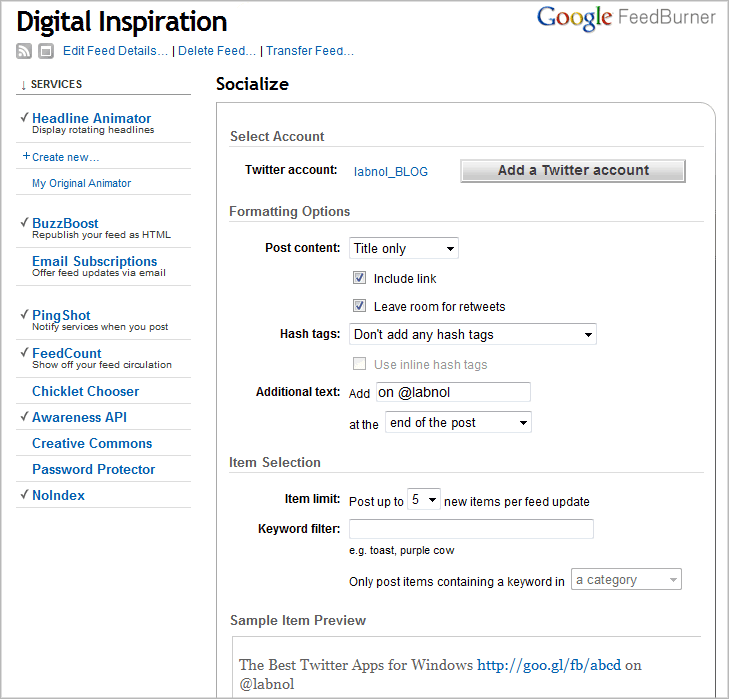 Currently, you can only integrate FeedBurner feeds with Twitter accounts but going forward, am sure Google will include other social services into the loop as well particularly Facebook (and maybe Orkut). Google already provides a free URL shortening service to Google Apps users – it’s called Google Short Links – but now they could be preparing a public launch with goo.gl. Cute name!